Not so long ago, a VR system required a million-dollar supercomputer. Nowadays the top VR systems are using clusters of desktop computers, dramatically reducing the price and maintenance costs. To be able to interact with a virtual world, the computer needs to know where your body stands through input devices called trackers. 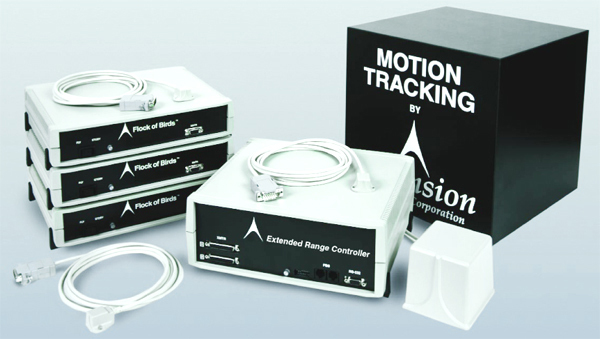 The most common trackers used to be magnetic trackers, (Polhemus, Ascension) but they require cables (except the new Polhemus Patriot Wireless) and can lose precision as the magnetic field is perturbed by metal. The new trend is to use optical tracking (A.R.T, Vicon, Motion Analysis, IO Tracker, Natural Point) by putting inexpensive markers on your body and watching them through special video cameras. This technique has the advantage of being wireless and is becoming cheaper and cheaper, with motion capture solutions starting at 5’000$. 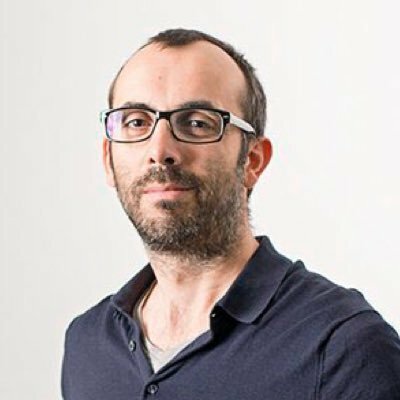 Inertial tracking (XSens) is another very interesting option: it is standalone and very responsive, but has the disadvantage that positional data are drifting very fast (even though a full body capture is greatly improving the stability). Orientation data are pretty stable. But this solution isn’t (yet) ready for a precise head tracking required to generate a correct perspective. Data Gloves aren’t used that much, except when you really need to know the position of each fingers. Immersion’s Cyberglove and 5dt Glove seem to be the most common. 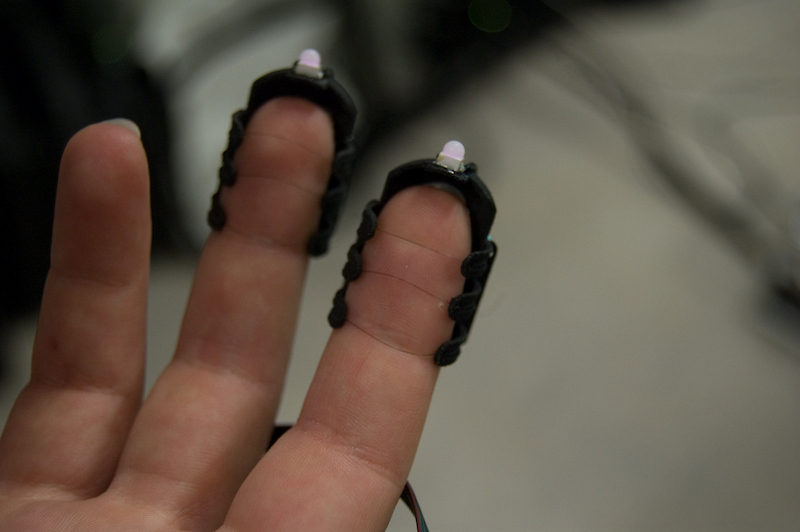 A.R.T Fingertracking is a recent product with very precise positional data that works with their optical tracking system. Some current research are focusing on markerless tracking, which don’t require the user to put any specific apparatus. 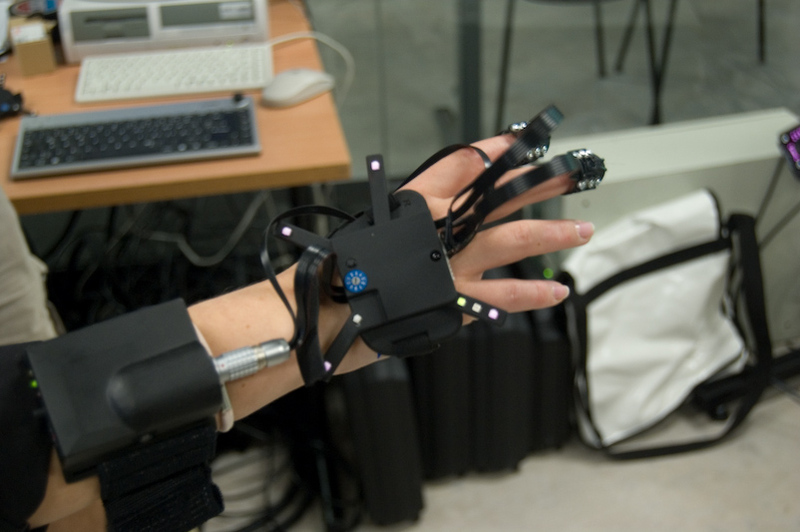 The Inca 6D by Haption, based on the Spidar system, is the only large scale haptics device commercially available. The Haption’s devices compete with SensAble’s Phantom for desktop haptics. 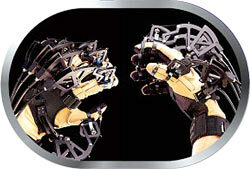 Immersion’s CyberGrasp exoskeleton gives force feedback to both your hand and your fingers. How do you walk inside a virtual environment ? This is still a major issue and some answers begin to appear. The omni-directional treadmill, part of the Cyberwalk project, could be a near-ideal solution if it was affordable. The VirtuSphere is already a commercial product and much more affordable (50-100 k$). 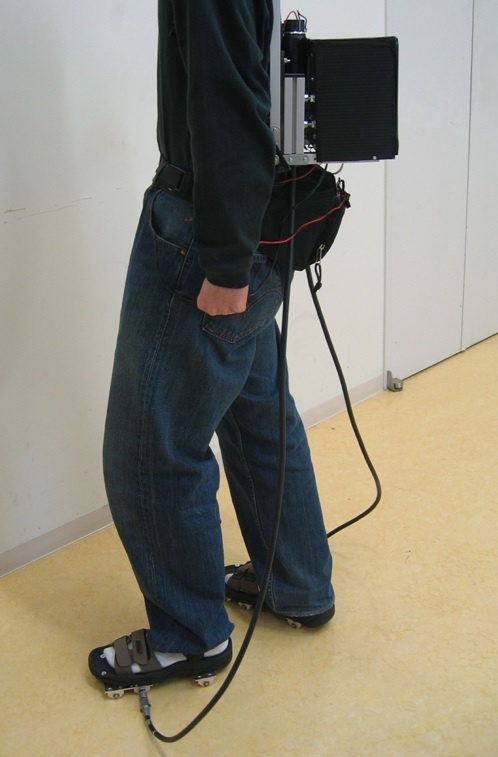 Some other research prototypes include the CirculaFloor with moving tiles, and the VR Shoes, both by the Tsukuba university. Very interesting article. I think that finger tracking can lead to very precise interaction which is necessary to develop more applications making users really active in the virtual environment, like 3D modeling application for example. The goal is really to spread the information. I like the simplicity of Virtusphere, but it wouldn’t be suitable for use in a VR cube because you have a big sphere around you (obviously). 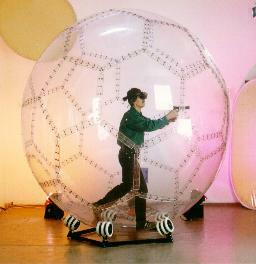 What if you took that sphere and combined it with the ideas from the omni-directional treadmill? Instead of the person standing inside the sphere, you set the sphere in the floor with only the very top exposed. The user could then walk on the sphere in any direction, kept steadily in place with a harness, and still retain full visibility. One nice thing about the virtusphere is that it doesn’t require any motor. The sphere reacts nearly instantly to your movement thanks to your weight only. The treadmill has to analyse your motion and start the motion mechanically. These new VR devices are really fascinating. Some of them can solve the problem of travelling in a infinitely extended plane ground of the VR world. Still, it is difficult to figure out how to let the player get a ture feeling of walk on an uneven surface, such as climbing mountain. Do you know any technique advances of solving this problem? I am interested in it. I’d say the OmniDirectionnal Treadmills could be inclined to get the feeling of climbing a mountain, or lots of small tiles as in the CirculaFloor could be used and also inclined. Or maybe put small treadmills on small inclinable tiles of the CirculaFloor. Or use some tactile devices usually made for the fingers under the foot. It could be done I think, the problem is that if there is no real use for it nobody will do it. And it will probably be very expensive at first, so somebody would need a really good reason to built such a device. Yes, you are right. The need is the power for new inventions. At present, treadmill seems fit for most applications.